This week, the Chronicle concludes a story that we have been following for the last few weeks: The war and then the subsequent cease-fire that followed between the two noble Coalitions, the 300 Sparta and the Kracken. This ceasefire, which was agreed upon by a vote of its members, has been enforced strongly by the leaders of both coalitions. This is not to say that no member has broken the bond, but those that did have been swiftly and justly dealt with. This can be seen from a message sent out by the Hegemon of 300 Sparta. The Chronicle is glad to see that these two powers of the realm have put aside their differences and can now focus their attention on more pressing matters, such as the ever present threat of Xerxes and his foul minions. In other news, a new battle was brewing in the realm. 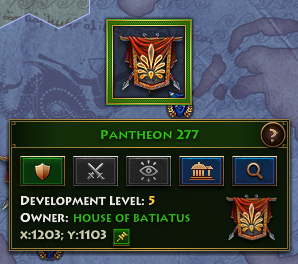 The coalition known as Second to None launched a strong attack on the House of Batiatus, a coalition that has carved its name out in the realm and now rest strongly on the front page of the most powerful coalitions to grace this realm. The attack, which led to swift retribution, was launched by Duma. What provoked the attack is yet unknown even to the House of Batiatus, but the results are indisputable. House Batiatus and their stout defenders surged to the walls of their Pantheon and crushed the attacker’s forces. The results of this battle, as can be seen from the above report obtained by the Chronicle, paints a gruesome picture. 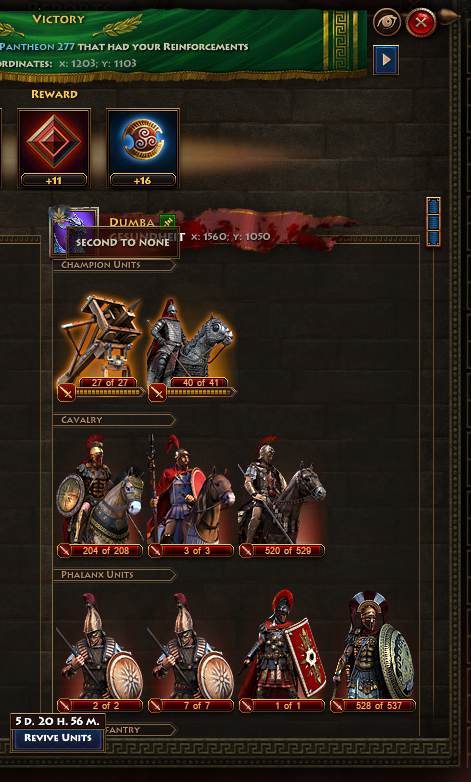 The forces of Duma are battered and broken as they crash against the gates of Pantheon 227. Whether or not this was simply a "tester" hit for the coalition Second to None is yet to be seen. Even now their forces could be planning their attack based on the calculations the above report was able to provide. Regardless of whether they are or not, House Batiatus are no amateurs: their leadership and their defenders stand ready to weather any oncoming storm, knowing well that their walls are strong and their men possessed of great conviction. Next week the Chronicle returns with another story, not of bloodshed or misery, but of prosperity, growth and rising influence. Until then, be safe and stand vigilant, for the forces of Xerxes are never far off in the distance.